The state has created a new bike program called Cycle Maryland. It looks very encouraging. In keeping with its secrecy in goverment policy, the state did this without telling too many people, at least not MoBike. But we’ll take it! Part of Cycle Maryland is a bikeway “retrofit” program that will fund local projects costing under $100K each. Counties and cities are supposed to request funding for specific projects. However this year the county was given only one week’s notice to come up with projects! As a result we ended up with just signage projects, i.e. signing existing bike routes, mostly streets. 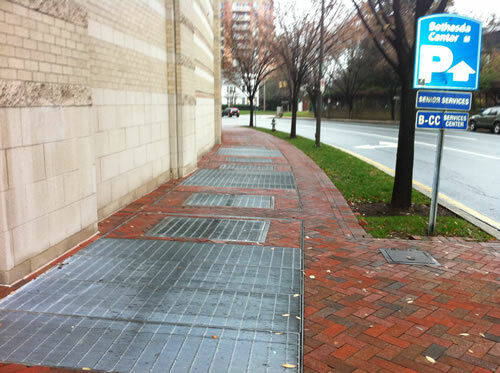 I personally suggested more robust improvements (in the 3 days notice I had) including upgrading the Bethesda Trolley Trail by White Flint Metro, providing better bike access to Rockville Metro and supporting two-way travel on Woodmont Ave to Bethesda Metro and the Capital Crescent Trail. But things were too rushed. Fortunately the state is requesting another round of projects from counties and cities, to be funded in 2013. They’re accepting project submissions from local jurisdictions through May 4th, 2012. All these signs are part of a comprehensive signed route network for the county, which we need. But we can do a lot better than just that! U.S. Senate Transportation Bill amended to include biking/walking funds Bike lanes next to parking – how wide is wide enough?